Category: Double Glass Lean to Greenhouses, Greenhouse Kits, $10,001 - $15,000, Lean-To Greenhouse Home Attached, Traditional Series - Double Glass Lean-to, More..
All lean-to greenhouses and lean-to's are currently on sale. Please call 1-800-665-2124 for your free quote! All Traditional Series lean-to's have straight eaves. All Traditional Series lean-to's have straight eaves. This quality home attached lean-to is an architectural delight, and is sure to create a stunning focal point in any garden setting. This popular traditional lean-to is designed to attach to an existing wall and is also designed to offer the maximum natural light for year-round gardening. This double glass garden room offers both beauty and durability. Built to withstand harsh weather conditions, the durable aluminum frame comes with an attractive enamel paint finish. Large automatic roof vents provide air circulation and the wide storm/screen door comes with a key lock and can be placed on either end. 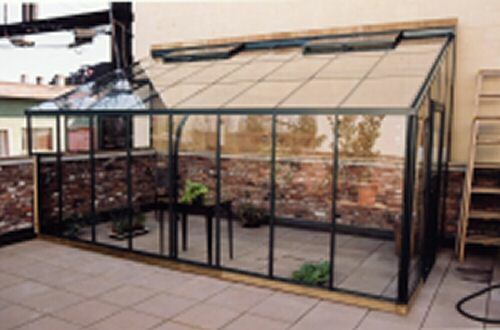 This double glass straight eave lean-to has been designed and constructed to the highest engineering standards for over 50 years! Back Ridge Height 10' 4 1/8"
The standard color on this lean-to is white. It is also available in either Forest Green or Dark Brown for an additional fee. If you would like one of these colors, please select from the color box below when checking out. Photo shown may not be actual size.Option to downgrade door to standard storm door with twinwall polycarbonate insert. Please note that shipping is not included. Please call 1-800-665-2124 to obtain your shipping fee, or a quote for custom sizing or custom paint colors.